This November marks the 100th anniversary of Albert Einstein completing his masterpiece of general relativity, an idea that would lead, one world war later, to his unprecedented worldwide celebrity. In the run-up to what he called “the most valuable discovery of my life,” he worked within a new sort of academic comfort. And in just ten years, he had moved from the far margins of science to the epicenter of scientific prestige. This position and this move came about in no small part because of his friend Max Planck, twenty-one years his elder. The major shift in Albert Einstein’s career began in 1905, when he submitted a number of revolutionary papers to the leading physics journal, Annalen der Physik. Max Planck, the lead editor for theoretical work, was among the first to read them. At the time, Einstein, the young patent clerk, was truly an outsider. But Planck recognized the work’s innovative genius, and he green-lit publishing the articles, including two that outlined what we now call the special theory of relativity. Planck, who took a very broad view of physics (and physical chemistry, philosophy, linguistics, et cetera), was already primed for relativity. In 1898 and 1899, he had exchanged a series of letters with the Dutch physicist Hendrik Lorentz, trying to reconcile the crazy-making results from speed of light experiments. After some clever but fruitless head scratching, he returned to the work that would soon give the world a quantum breakthrough and a new fundamental constant, h. But Planck now understood that classical physics had a nasty problem when it came to the speed of light as measured by different observers. 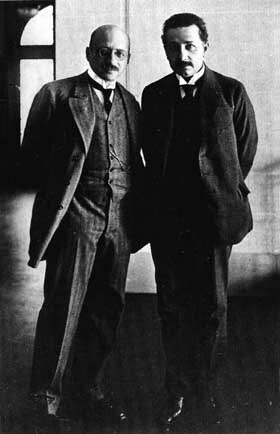 Fritz Haber and Albert Einstein at the Kaiser-Wilhelm-Institut fuer physikalische Chemie und Elektrochemie, Berlin-Dahlem, 1914 by S. Tamaru. Used with permission by Archiv der Max-Planck-Gesellschaft, Berlin-Dahlem. In November of 1915, Einstein completed his theoretical masterpiece. Newton’s falling apple no longer felt the heavy tug of a force; it simply followed the gentle warp and weave of spacetime near our massive planet. But Einstein had not convinced that many colleagues, and major experimental tests would have to wait. The war years posed challenges for both men, but more so for Planck. He lost his eldest son at Verdun and both of his twin daughters to complications in childbirth. “Planck’s misfortune wrings my heart,” Einstein wrote to a friend. “I could not hold back the tears when I saw him… He was wonderfully courageous and erect, but you could see the grief eating away at him.” The two sometimes played music together in Planck’s home to escape their times and probably to escape talking politics. Planck, the concert-grade pianist, bound himself to his nation and its Kaiser, but Einstein, the casual violinist, leaned strongly to the left. Their friendship would later be wrecked between Planck’s conflicted patriotism and Einstein’s prescient horror during the rise of the Nazis. The music and the letters ceased. But after Max Planck died in 1947, Einstein, who never set foot in Germany again, wrote a moving tribute to Planck on behalf of America’s National Academy of Sciences. And more privately, he wrote a short note to Planck’s widow, telling her, “The hours that I spent in your home, and the many conversations that I conducted in private with the wonderful man will for the rest of my life belong to my beautiful memories.” In some sense, their concert – including all their tension – plays on, as general relativity and quantum theory stand awkwardly together as two irreconcilable pillars of modern physics. Featured image credit: Black hole by NASA. Public Domain via Wikimedia Commons. Brandon R. Brown is a Professor of Physics at the University of San Francisco. His biophysics work on the electric sense of sharks, as covered by NPR and the BBC, has appeared in Nature, The Physical Review, and other research journals. His writing for general audiences has appeared in New Scientist, SEED, the Huffington Post, and other outlets. 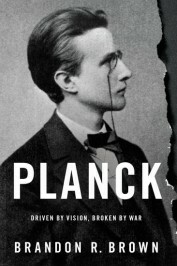 He is the author of Planck: Driven by Vision, Broken by War. SRT is completely erroneous since it is based on the wrong kind of transformations: they have lost the scale factor characterizing the Doppler effect. First, Lorentz considered a more general form of transformations (with a scale factor), but then he, and also Poincare and Einstein equated it 1 without proper grounds. Their form was artificially narrowed, the formulas became incorrect. This led to a logical contradiction of the theory, to unsolvable paradoxes. Accordingly, GRT is also incorrect.